The Good Ideas, Inc. Garden Wizard Raised Bed Garden Hybrid is the most innovative raised bed on the market today. This raised bed uses four 50" wall sections that interlock to enclose a 4'x4'x10" space. It is the very first raised bed garden that can water itself. That's right, this patented design makes use of specially designed soaker hose that connects to each wall. When you fill one wall with water, it transfers to each of the other walls while simultaneously watering the garden. The unique soaker hose uses a slow-drip, wicking action that only delivers water to the soil when needed. So you can be assured that plants will stay watered, but not over-watered. 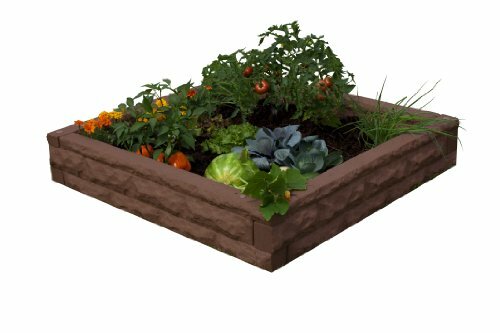 But the wall sections can also work without the soaker hose, providing you with a beautiful, sturdy, and inexpensive rock wall border.Continuing to show itself as the leader in innovation, Good Ideas has made this raised bed garden even better. With the incorporated composting tumbler and tea collection wall, you can create compost and compost tea right at the garden. The compost can be pulled right out and into the bed with no need to cart it across the yard. The tea-collecting base mixes the compost tea directly into the watering system so your plants receive nutrient packed water almost instantly and without effort.Most raised bed gardens require a lot of set up time and effort to complete and use treated wood or other unsafe and easily damaged materials. The Garden Wizard RBG takes no more than 5 minutes from start to finish. Simply layout your setup location, connect the wall sections with the pins, and attach your included soaker hose (optional). If you're looking for more than a 4x4, simply add a matching Raised Bed Garden Extension Kit to your order and expand to a 4x8. You can add as many as you please. It's made in the USA using safe and strong Polyethylene that contains FDA approved materials. Available in Light Granite, Dark Granite, Red Brick, and Sandstone. If you have any questions about this product by Good Ideas, contact us by completing and submitting the form below. If you are looking for a specif part number, please include it with your message.